St. Fidelis of Sigmaringen was a Capuchin friar who was a major figure in the Counter-Reformation, and was murdered by his opponents in Switzerland. He was born as Mark Roy in 1577, in Sigmaringen, a town in modern day Germany. He studied law and philosophy at Freidburg. Roy taught philosophy at the same University of Freidburg, ultimately earning the degree of Doctor of Law. He did not drink wine, and wore a hair shirt, and was known for his modesty, meekness and chastity. He traveled Europe for six years, with frequent visits to hospitals, Churches, in Adoration, and even gave to the poor the very clothes off his back. When he returned, he practiced law at Colmar, In Alsace. He came to be known as the poor man’s lawyer. He practiced with the highest morality. He became disenchanted with the evils associated with his profession, and was determined to enter the Capuchin Friars. Upon entering the Capuchin Order, the guardian gave him the Religious name of Fidelis, the Latin word for “Faithful”, referring to the Book of Revelations, which promises a crown of life to him who shall continue faithful until the end. He finished his novitiate and studies for the Priesthood, presiding over his first Mass at the Capuchin Friary in Fribourg, on the feast of St. Francis of Assisi, October 4, 1612. He immediately was employed in preaching and in hearing confessions. After becoming Guardian of the Capuchin Friary in Weltkirchen, many residents of town and neighboring places were reformed by his zealous labors and several Calvinists were converted. The Congregation of the Doctrine of the Faith, commissioned Fidelis to preach among the Grisons. The Calvinists of that territory, being incensed at his success in converting their brethren, threatened his life. On April 24, 1622, Fidelis made his confession, celebrated Mass and then preached at Grusch. At the end of his sermon, which he delivered with more than ordinary zeal, he stood silent all of sudden, with his eyes fixed upon Heaven, in ecstasy. He foretold his death in the clearest terms, and began signing his letters, “Fr. Fidelis, in days ahead to become food for worms”. After that service, he and several companions traveled to Seewis. His companions noted that he was particularly joyful. In a campaign organized by the Habsburgs, Fidelis was preaching under protection of some Austrian imperial soldiers in the Church at Seewis with the aim to reconvert the people of Seewis to Catholicism. During his sermon, his listeners were called “to arms” by the Calvinist agitators outside. Some of the people went to face the Austrian troops outside the Church. Fidelis had been persuaded by the remaining Catholics to immediately flee with the Austrian troops out of Seewis, which he did. He returned to Grusch. On his way there, he was confronted by twenty Calvinist soldiers who demanded unsuccessfully that he renounce the Catholic Faith, and then murdered him. It is said that a Catholic woman lay concealed near the place of his martyrdom, and after the soldiers were gone, coming out to see if she could help, found the martyr’s eyes open and fixed on the heavens. The Catholics buried him the next day. 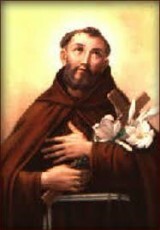 The rebels were soon after defeated by the Imperial troops, an event that St. Fidelis had prophesied. The minister, who participated in St. Fidelis’ martyrdom, was converted by this circumstance, made a public confession and abandonment of his Calvinism and was received into the Catholic Faith. After six months, his body was found to be incorrupt, but his head and left arm were separated from his body form the attack. The body parts were then placed into two reliquaries, one sent to the Cathedral of Coire, at the request of the Bishop, and laid under the High Altar. The other was placed in the Capuchin Church at Weltkirchen in Austria. St. Fidelis of Sigmaringen was a Capuchin friar who was a major figure in the Counter-Reformation, and was murdered by his opponents in Switzerland. He was born Mark Roy in 1577, in Sigmaringen, a town in modern day Germany. He studied law and philosophy at Freidburg. Roy taught philosophy at the same University of Freidburg, ultimately earning the degree of Doctor of Law. He was disheartened by the field of law, and quit his practice in Alsace. He entered the Capuchin Friars, and became a Priest. He was immediately sent out to preach. On one of his trips, he was attacked by a group of Calvinists and was martyred for the faith. He had the gift of Prophecy, and during Mass went into ecstasy, witnessed by many. He is highly revered as a Franciscan saint.